The court said states can collect sales taxes directly from sellers outside their borders, unlocking hundreds of millions of dollars in tax revenue and leveling the playing field for brick-and-mortar stores. 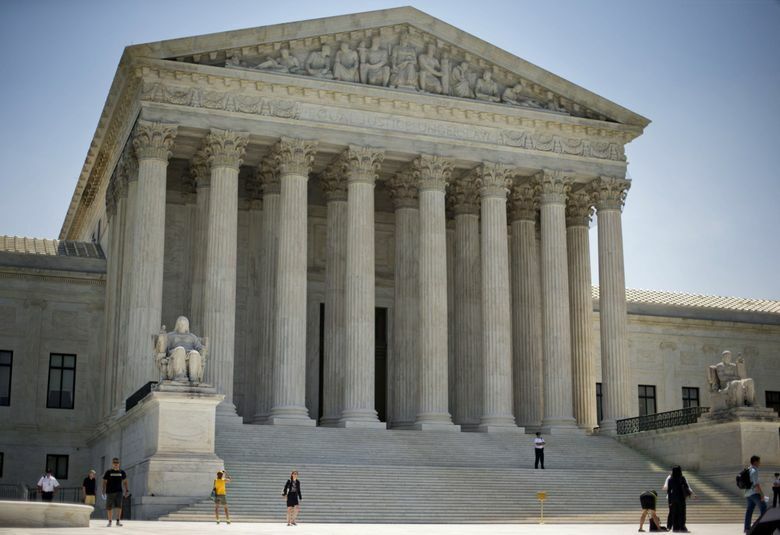 The U.S. Supreme Court’s sales-tax ruling Thursday could finally correct a fundamental unfairness local retailers and state governments have groused about since the dawn of e-commerce. But how it will play out in the thicket of state tax laws remains to be seen. The high court ruled 5-4 that states can now collect sales taxes directly from sellers outside their borders, unlocking hundreds of millions of dollars in tax revenue and leveling the playing field for local businesses and big-box stores that suffered against out-of-state competitors that did not collect sales taxes, effectively selling their goods at a substantial discount — 10.1 percent in Seattle. Washington, for example, already expects to see an estimated $432 million in new revenue from a recent push to expand online sales-tax collections. State lawmakers were confident enough that the Supreme Court ruling would be favorable to put that number in the current two-year budget. Washington, which doesn’t tax personal income or capital gains, depends heavily on sales-tax revenues to fund government services. In fact, 52 percent of the state’s general-fund revenue — which pays for schools, prisons and social services, among other programs — comes from retail sales and use taxes, according to a 2016 report. The rise of online shopping has meant Washington is collecting fewer tax dollars than it otherwise would have been, according to state Sen. Reuven Carlyle, D-Seattle, who in 2015 sponsored legislation to expand online sales-tax collection in the state. “If you look at the implosion of big-box stores, if you look at the explosion of online purchasing, these major, life-changing market trends … have a profound effect on the state’s tax policy,” Carlyle said. The imbalance has also hurt brick-and-mortar stores. For years, businesses have wrestled with the reality that their online competitors could effectively sell similar goods tax-free, and thus less expensively, said Mark Johnson of the Washington Retail Association. The ruling is expected to have little impact on e-commerce giant Amazon, which last year began collecting sales taxes in every jurisdiction that has one. However, its Marketplace business, which facilitates sales from independent merchants and now accounts for half of its unit sales, still faces sales-tax liability questions. Washington is among a handful of states with new laws targeting sales made through such marketplace facilitators. Amazon declined to comment on the Supreme Court ruling Thursday. The ruling, which focused on South Dakota’s 2016 sales-tax law, puts significant limits on how states can levy sales taxes on businesses with no office, warehouse or other physical presence in their jurisdiction — so-called remote sellers. The justices sought to ensure that out-of-state sales-tax collections not place an undue burden on businesses or favor local sellers over their remote competitors, violating the Constitution’s interstate commerce clause. For example, the court’s majority opinion cites a provision of South Dakota’s law that exempts from the sales tax remote sellers with less than $100,000 in sales or 20 transactions a year in the state. It’s now up to individual states to determine whether their laws fall within those and other limits outlined in Thursday’s ruling. A Washington law that took effect Jan. 1 exempts out-of-state businesses with annual sales of $10,000 a year or less. Businesses with more sales now must either collect taxes from customers directly or notify customers that they are liable for the tax and report sales to the state, which would pursue individual purchasers for the taxes they owe. “What we find is that a lot of sellers would just prefer to register and collect the tax from the buyers, as opposed to complying with that use tax reporting requirement,” said Marke Greene, Seattle-based partner in charge of state and local taxes at accounting firm Moss Adams. Patti Wilson, marketplace fairness project manager at the Washington Department of Revenue, said the court ruling will likely result in the state eliminating the notification and reporting option. She said the state’s sales threshold may also need to be increased from $10,000 in light of the Supreme Court ruling. In other ways, Washington and South Dakota have similar online sales-tax regimes. For example, they both adhere to the Streamlined Sales and Use Tax agreement, a longstanding effort to rationalize state-by-state sales-tax policies that counts more than 20 members. Justices cited that agreement, which requires simplified tax structures and other provisions that “made life easier for retailers, and Washington has done exactly the same thing,” said Scott Peterson, vice president of U.S. tax policy at Avalara, a Seattle-based tax-compliance software maker. States with sales-tax laws that do not adhere to the Streamlined agreement or that have more complex approaches to online sales taxes are now “in limbo as to how this ruling impacts them,” said Greene of Moss Adams. While the Supreme Court spoke approvingly of the law, it sent the case back to South Dakota’s highest court to be revisited in light of the court’s majority opinion, which comes after the U.S. Congress dawdled for years on whether to pass a law to require online sales-tax collections. The stock market reaction pointed to winners and losers. Furniture seller Wayfair and online merchant Overstock.com — two of the parties to the case — saw their shares fall, along with other online retailers. Avalara, meanwhile, which went public last week, saw its shares spike after the ruling and ultimately gain 13.4 percent on Thursday. The Supreme Court credited South Dakota’s offer of free sales-tax administration software to businesses. Avalara is one of seven software providers certified under the Streamlined agreement for this purpose.